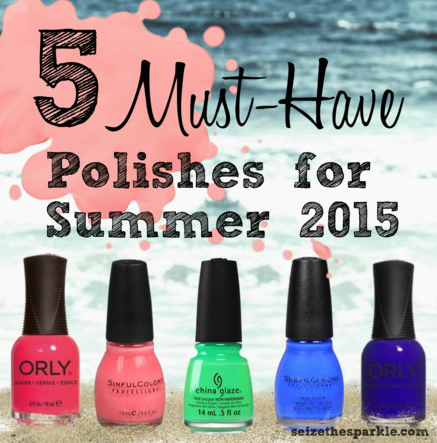 When I think of the perfect nail polish for Summer, I can't help it... brights and neons always come to mind. Colors that look absolutely gorgeous whether you've been relaxing on the beach, or reading in the shade. Bolder than the pastels of Spring, but brighter than the vampy shades of Fall. Shades that channel fun, because isn't that really what summer is all about? 1. Orly Va Va Voom... part of Orly's Core Collection, this shade is a perfect warm toned neon pink that is seriously bright! 2. SinfulColors Island Coral... this is quite possibly the perfect coral. Not too pink, but not too orange either. 3. China Glaze Treble Maker... I'm probably going to regret not buying a backup bottle of this, because I've been wearing it a lot. But the way this neon spearmint makes my nails pop? I can't help but reach for it! 4. SinfulColors Endless Blue... Fiiiiiinally added this to my collection. I haven't posted about it, but seriously an awesome bright cobalt creme. 5. Orly On The Edge... A super saturated blurple that's maybe a smidge dark for the season, but I'm loving it regardless. It's got this electric vibe to it, and using it in seriotypes or stamping? Some major swoooooning going on over this one!